Robb Walsh’s Oyster guide: Olympia’s are the morsels on the bottom row (http://www.citypages.com/2009-02-11/news/a-guide-to-oysters/). I am admittedly a food snob. Still, I can feast like a king on a tangy, umami-bomb of Vietnamese banh mi sandwich, a steal for about $4.25 each. Of course, you can cook simple, delicious meals at home for less. But when we spend $60 or more on a meal for two, we expect it to be good. Unfortunately, that wasn’t the case tonight in Olympia. En route to Seattle (on rainy, Thanksgiving-traffic-clogged I-5), on a whim we stopped for dinner in the charming capital city of Olympia on the south Puget Sound. We considered Trinacria, a supposedly stellar red sauce and homemade pasta joint whose name (the term for “Kingdom of Sicily”) reminded us of an Italian deli we loved in Baltimore. Then we got a hankering for oysters, reading that the petite native species has been revived here. The obvious Oyster House seemed too touristy. We wanted to eat oyster burgers and shooters at the Fish Brewing Company pub, but alas, no minors–no one under 21–not even a five-month-old baby who subsists on breastmilk–are allowed on the premises. Just like at our beloved Squirrel’s Tavern in Corvallis. Having kids does limit your choices. We were directed instead to Ramblin’ Jacks, which had a hip vibe but alas no oysters (just fried pickle chips) on the menu. Sometimes you just become too blinded by a quest for something like oysters. We should have been content with wood-fired pizza at Ramblin’ Jacks. We would have had a great meal at the brewery, if not with child. Somehow we found ourselves at the dated seafood and brunch-focused Budd Bay Cafe only because they had pan-fried oysters on the menu. The excessive Christmas decor and cloying Christmas music should have been a sign. They didn’t have oysters fresh enough to serve on half-shell, just the pan-fried “Pacific Northwest” variety. Their salmon was King, but farm-raised. Discerning diners know better out here. Budd Bay’s was hardly a locavore, but rather a Sysco-inspired, menu. I just no longer have a tolerance for white tablecloth, country club-style food that is expensive, bland, uninspired and often inedible. Touristy waterfront seafood restaurants are often the worst offenders. You go to these restaurants–the Lobster Trap in Maine, Gracie’s Sea Hag in Depot Bay, Ore., the Rusty Scupper in Baltimore, Jake’s in Hull, Mass.–with such expectations. The menu items tempt–the fish descriptions sound so fresh–you have the illusion it was just plucked from the water outside the restaurant’s window. But the dishes generally disappoint. Usually, the seafood is fried and the chowder’s too unctuous, thick and creamy, so you leave feeling a little sick and so wishing you’d spent your $60 elsewhere. So we wasted our one meal in Olympia. Somehow I just felt cheated, because I told the hostess-owner we were there to try to the local oysters. So I felt betrayed when we weren’t served the local delicacy. 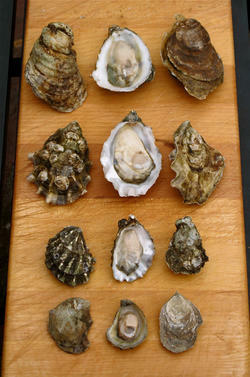 Sure, they were Washington-raised oysters, but they were the much larger, less delicate and briny Pacific variety. And they weren’t even that fresh. They were the last oysters left in the bucket, bathing in a sludgy liquor. She went to retrieve the container when I asked if not the local Olympia oysters where they were from. I know I seemed like the characters in Portlandia who ask in a restaurant about the source of their poultry, abruptly getting up to go visit the local chicken farm. But this is what I care about. I want to know what species of oyster I’m eating and where it was raised. I expect it to be fresh. I wanted to vote with my dollars and my tastebuds for the Olympia oyster, to support ecological efforts to revive the Pacific Northwest’s only native species. But sadly out-of-touch restaurants like the Budd Bay Cafe, who care more about boasting waterfront views than sourcing quality local ingredients, just don’t get it. Loved the reference to Jake’s, site of many Hull dinners for us and Eliz’s bridal shower! It used to be much better than it is now.